GSA Says Trump D.C. Hotel Lease Is Valid, Despite Ban On Elected Officials : The Two-Way The General Services Administration says while the contract bars elected officials, the Trump Organization may lease the Old Post Office because President Trump moved his businesses into a trust. The General Services Administration says President Trump is legally entitled to hold a lease for a hotel in a federal government-owned building, regardless of what critics say. 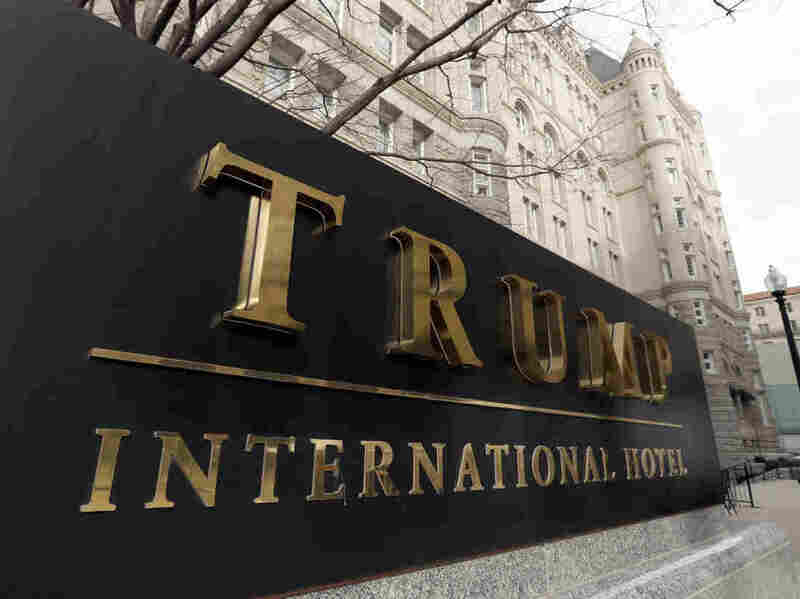 President Trump got good news on Thursday from the federal agency that oversees the three-year-old lease on his five-star hotel in Washington, D.C. The General Services Administration said in a letter that the Trump Organization is in "full compliance" with the lease on the luxury hotel that's located just blocks from the White House. Many ethics and contract experts have called upon GSA to end the lease, noting that the contract language specifically says no "elected official of the Government of the United States ... shall be admitted to any share or part of this Lease, or to any benefit that may arise therefrom[.]" But GSA contracting officer Kevin Terry wrote that reaching "simplistic 'black and white' conclusions regarding the meaning" of the contract's ban on elected officials was not appropriate. He determined the lease is valid because Trump moved his interests in the building to a revocable trust, which is being managed by Trump's oldest sons and other associates. Trump is the sole beneficiary of that trust. Terry led contract negotiations with Trump in 2013. In his letter Thursday, Terry said the property had been a money loser for the federal government before Trump landed the lease. The Trump Organization has been paying $250,000 a month in rent since it signed the lease, according to Terry. Stephen Schooner, an expert on government procurement law at George Washington University, said the GSA decision was "unbelievable." Terry's conclusion is "unpersuasive, as a matter of law" and harmful to the "integrity — and thus credibility — of GSA, the presidency and procurement process," Schooner said. Reps. Elijah Cummings and Peter DeFazio, top Democrats on the House Government Oversight and the House Transportation and Infrastructure committees, respectively, condemned the GSA conclusion. They argue that GSA never intended for politicians to profit from the government-owned building, which is why it included the language banning elected officials. "This new interpretation renders this lease provision completely meaningless—any elected official can now defy the restriction by following this blueprint" of creating a trust, they said in a statement. Trump signed a 60-year lease in 2013 for the building that once served as headquarters of the U.S. Post Office. The Trump Organization spent upwards of $200 million on renovations and reopened it as a hotel about a month before the Nov. 8 presidential election.